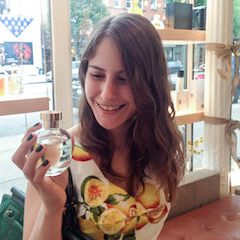 My policy has always been that I don’t review discontinued perfumes. It’s just cruel, right? But while Tea for Two is very much discontinued, it does occasionally pop up on eBay or in those huge sales L’Artisan does about twice a year. It always sells out within minutes, so if you ever do happen across a bottle, I want you to be prepared! 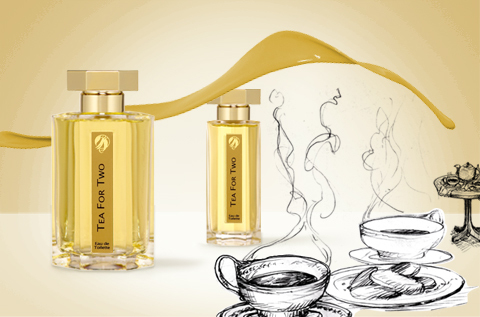 Tea for Two is supposed to evoke Lapsang Souchong, that bafflingly smoky tea, but it’s much softer than its inspiration. This really is a delightfully strange fragrance. It juxtaposes the traditional chai spices (cinnamon, cardamom- the notes list ginger, but I don’t smell it) with this funny leathered paper note, almost like cardboard. Over time, Tea for Two becomes sweeter and more honeyed. I like Tea for Two best at the end, when it is delicious and comforting but still just a bit odd. I always wonder what I would think of Tea for Two if I had tried it before Dzing!. I think that I would have thought it unique and marvelous. Chai tea and cardboard! But for better or for worse, I tried Dzing! first, and now I can’t help but perceive Tea for Two as Dzing! overlaid with cinnamon. Between the two, I think I prefer Dzing!, but both are unusual and enchanting fragrances, and I can absolutely see myself eventually deciding that I really need both. What do you think of Tea for Two? Did you manage to snag a bottle before it was discontinued?